If you are a veteran who is considering retirement in Central Texas, you might wonder where the ideal spot to call your home might be. The greater metropolitan area around Austin offers many options from which you can choose. At Kissing Tree, we believe one of the top regions for veterans to consider when they are planning their retirements is the Texas Hill Country. In this region, you can find beautiful scenery, rolling hills, bluffs, meadows, lakes and everything that you need to enjoy your golden years. The scenery is just one reason that many veterans are choosing to retire in the Texas Hill Country. Retirement doesn’t mean that you have to plan for years of staying at home alone. When you choose to live in the Texas Hill Country, you’ll find that almost unlimited outdoor activities are available. The Texas Hill Country boasts hiking trails, lakes, and numerous outdoor activities that appeal to many. Whether you enjoy a good game of golf on a pristine course, prefer a quiet day of fishing or want to head out sailing, all of these options are right at your fingertips when you retire in Hill Country. When you live in the Texas Hill Country, you will find that you have great proximity to both San Antonio and Austin. Both of these large metropolitan areas are within easy driving distance. Living in the Hill Country also allows you to easily access the VA Clinic in New Braunfels, Randolph AFB and the San Antonio Military Medical Center. At the same time, you can enjoy the panoramic views and natural beauty that surrounds you without having to deal with the hustle and bustle of life in a larger city. Texas values its veterans and offers a special loan program that allows you to purchase land in the state. This loan, which is available through the Texas Veterans Land Board, allows you to put just 5 percent down on your purchase. This is the smallest allowed down payment for Texas land in the state. You can use this loan to purchase land in parcels of one acre or more, including the Hill Country. Special discounts are also available for disabled veterans and the surviving, unmarried spouses of veterans to purchase land. If you qualify for a VLB loan, you may use it to purchase land in gated and non-gated communities alike as long as the land that you are considering meets the acreage requirements. The land’s value is also capped at a maximum of $100,000 for this loan. There are many reasons that veterans choose to retire in the Texas Hill Country. Whether you find the ability to enjoy active adult living opportunities or to simply enjoy the beautiful views, the Texas Hill Country is a great place to call home. 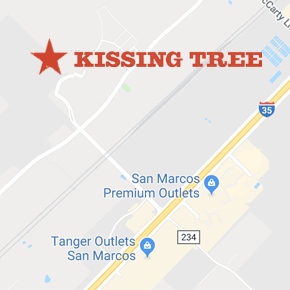 Kissing Tree offers a variety of different options from which you can choose so that you can find the home of your dreams.